I am very impressed by the uniform. The jacket and pants are well made and look spot on. Sizing was easy, ordered my usual jacket and pants sizes for a perfect fit. To start off the quality of these items is beyond amazing, it matches perfectly to my original. As far as sizing goes, with the trousers measure your actual waist and that will be the size you will want, this is about a total of 1" to let out in these pants. The jacket i ordered my normal size, my chest is 42 so i ordered a 42. There was plenty of room but after taking apart the liner and form fitting it to my body, i only took 2" out in the waist and 1" out in the chest. The jacket does come with a slight taper but was easy to work with if you know your way around a machine and have an understanding of tailoring. Overall i would reccomend this to anyone looking for a correct RAF uniform and something thats easy to work with. I received this order very quickly and had nice input from WPG about trying to find the correct size. The uniform was nicely made and fit well. One criticism, however, was the belt. The prongs on the buckle were sharp and I will need to file them down to avoid later injury. The belt also featured a small snap at the end to hold the excess portion down. This was poorly aligned and, when buttoned in place, causes the excess belt to loop forward. Easily fixed I suspect but I thought I would point it out. Otherwise, very please with the uniform and would do business with them again. very prompt despatch, & uniform was exactly as expected. Not cut exactly as a WW2 original, but not sold at bespoke prices either! General fit & appearance are very good, however the trousers I found to be cut a little slimmer in the body than I'd expected. Very fast dispatch of the item, and was not dissapointent with the item recieved. The fit and tailoring was excellent and is very hard to distingush frome an oringal. I have seen numerous RAF/RCAF uniforms from WWII and this set would be hard to distinguish from those. The tailoring is excellent as is the fit. Very happy with the kit. Very fast dispatch, good quality item. Thank you. It's a pity that bigger sizes are not available. 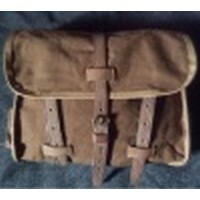 I purchased a set of the RAF officer Nr. 1 Service Dress uniform from WPG several years ago and was extraordinarily pleased when the set arrived. The overall quality of the material, cut, and accuracy of both blouse and trousers was exceptional. It was only after I wore the blouse a few times that I noted a strange anomaly in the blouse: the left and right side pockets were not perfectly aligned in a horizontal plane with each other. The right side lower front pocket was actually about a half inch lower than the left. In looking at the illustration of the chap wearing the blouse here, his lower blouse pockets also seem to be slightly out of horizontal balance, curiously. All right, a small and perhaps niggling complaint, but no genuine RAF bespoke officer''s blouse would be constructed with this discernible imbalance between left and right pockets. The tailoring of the blouse is otherwise perfect and well worth the cost, in my opinion. I am quite happy with the kit!